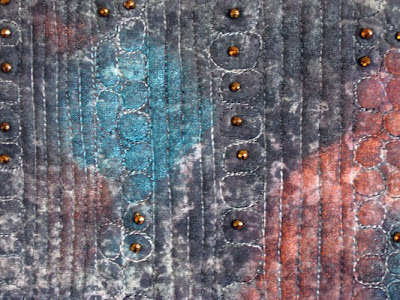 I've been wanting to start making quilted artist postcards and ACEOs (artist cards, editions & originals), largely for the fun of working in really small format, but also to have more-affordable art available for folks to buy. The energy behind this has been building over the last month or so...and today I did my first postcard as a gift for my friend Colette, who turns 60 tomorrow. Need I say I loved making this and I'm hooked?! My quilt this week -- Off The Wall (#35.09) -- started out as a piece of fabric that I printed a few weeks ago, and then it sat in my to-be-discharged pile awaiting further orders. But I was inspired by something I saw recently that I wanted to create on fabric, and it turned out this formerly unsuccessful sample was the perfect background. 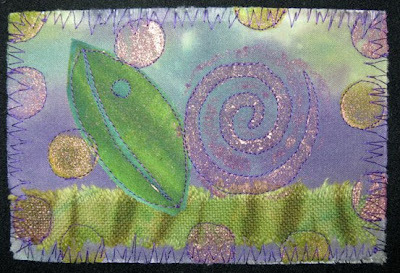 Variegated thread, Shiva Paintstix and flat-backed metallic beads finished it off. The piece reminds me of a slab of granite or marble. And speaking of marble, my mother used to make the most wonderful marble cake -- one of my sadly few good memories of her. And that's enough of that! I'm a big fan of deconstructed screen printing (DSP) ~ that's where you preprint a silk screen by placing textured objects underneath the screen, and squeegee-ing colored print paste over all of it to create impressions on the screen. 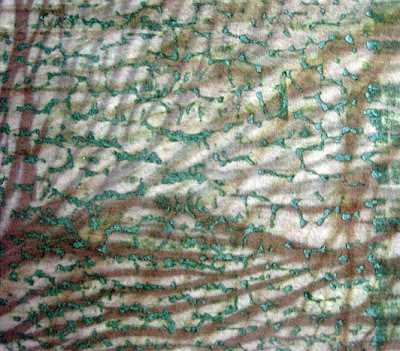 After drying, you print the screen onto fabric and the impressions deconstruct as you pull each print, resulting in different images each pull. 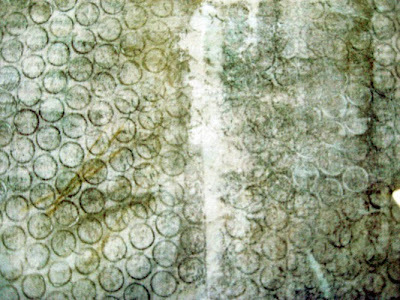 A couple issues ago, Quilting Arts Magazine featured a technique by artist Linda Colsh, called deconstructed rubbings. And I'd been anxious to try that, so I did, this week. 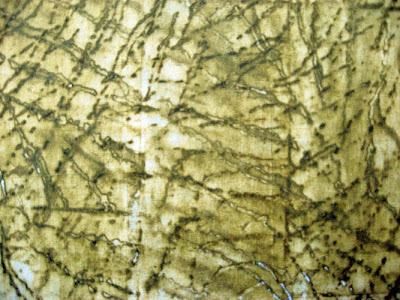 Deconstructed rubbings are made by rubbing watercolor crayons (I use Caran d'ache Neocolor II) on a screen that's been placed over textured objects, and then printing the screen with acrylic medium instead of print paste. 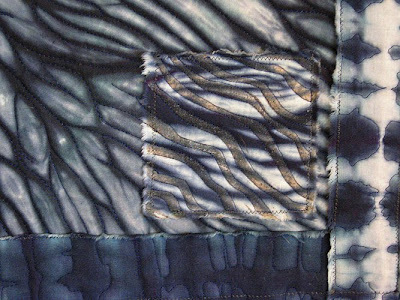 The acrylic binds the water-based color onto the fabric -- just like soda ash does with fiber reactive dyes. 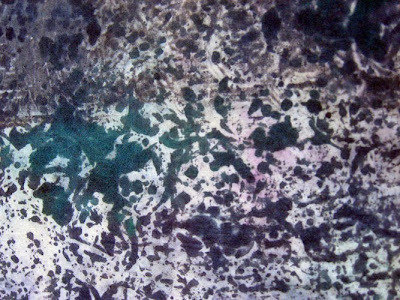 But I prefer not to slather acrylic onto fabric, which is one reason I try so many things with thickened dyes rather than using acrylic paint -- like monoprinting, etc. Acrylic stiffens fabric, and gives it a bit of a plastic feel. So after my initial attempt with the deconstructed rubbing process -- first photo, above -- I thought I'd try something else. 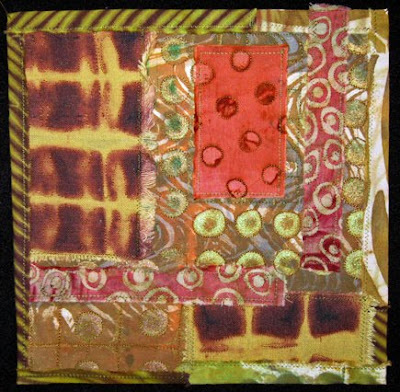 The next two samples were made with the deconstructed rubbing process -- watercolor crayon over textured objects on a silk screen -- but instead of using acrylic medium, I pretreated the fabric with Bubble Jet Set 2000 and let it dry, then used print paste to release the rubbing on the screen. The fabrics turned out a bit stiff still, but without that acrylic plastic feel. I even washed the samples in Synthrapol, but the hand of the fabric didn't change. 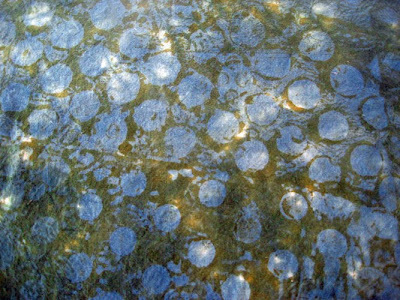 The fantastic part of the experiment, is that the water-based color is completely permanent on the fabric. There was no color loss at all. It's all definitely worth trying again, and tinkering with. I do think I'll try Linda's original process again with a more liquid acrylic medium, and perhaps even water that down a bit. And I'll try it again with BSJ treated fabric, perhaps thinning down the print paste, or maybe even just using water thickened with sodium alginate. 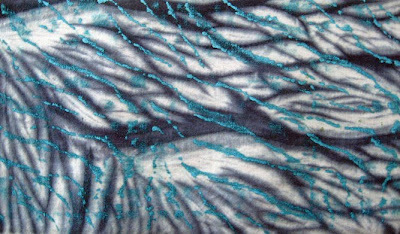 Last Friday I got out my Shiva Paintstix and went to work on some printed and/or dyed fabric ~ and these are some of my results. 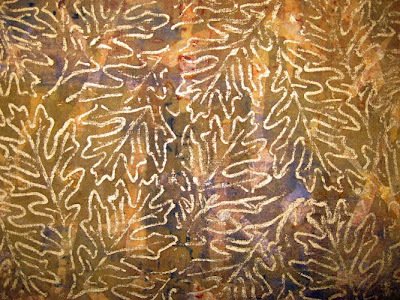 The first piece was printed and overprinted several times, and the metallic leaves really pulled it together. The rest of the pieces were shiboried, with the exception of the third piece, which was LWI dyed. Today I'll be preparing screens for deconstructed screen printing. Hard to believe it's been about a month already since I did this last time. And we'll see what else comes up! Just completed my weekly quilt today, and here it is...From The Ground Up (34/2009). Lovely, isn't it? 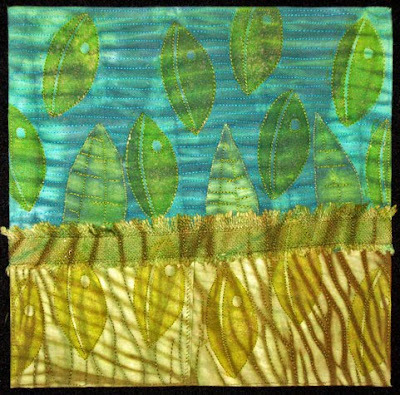 I had the inkling earlier in the week to do a quilt using green shiboried cotton to somehow represent grass, and this is what I ended up with. I love it! The sky part is shiboried cotton as well. 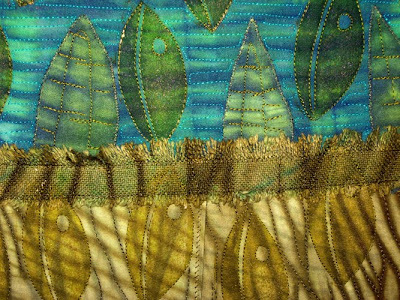 I fused three leaves made from a greener section of the blue fabric, then used a handcut stamp and metallic textile paint for the rest of the leaves. I do love just letting a project create itself, and going with it. I did a bunch of small pieces yesterday with Shiva Paintstix, rubbings on fabrics previously shiboried, painted or printed. I'll post photos of some of those tomorrow! I've been under the weather this week, which is why I haven't posted since last Friday. I haven't even been in the studio until this morning, when I completed the binding on my latest discharge quilt before having to stop and go home again. So here it is...Discharge Series, 8 ~ Out Of Africa. All the fabrics are discharged cottons, except for the dark strips (cotton/rayon) and the binding (cotton/linen). And all were discharged with bleach, except the dark strips (thiox). 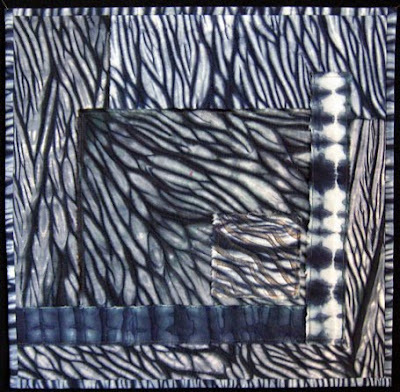 The backing is commercial batiked cotton. 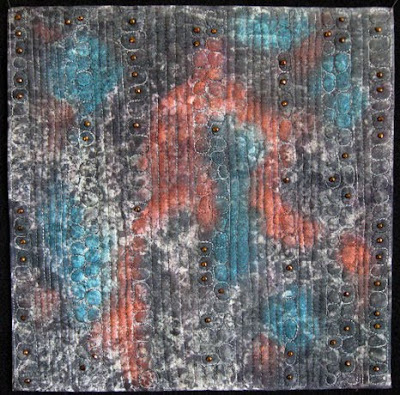 The finished piece is approximately 23" square. 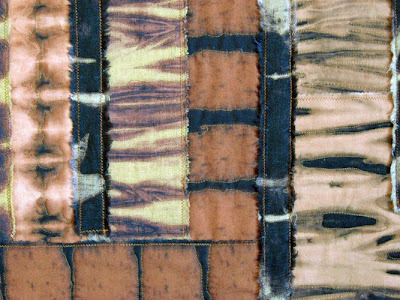 It's amazing how many different colors black will discharge to, depending on what the fabric was dyed with initially, and depending on the thread count of the fabric. The higher the thread count, the more black dye resists being discharged. Which makes sense, because the spaces between the threads are much smaller so the discharge cannot penetrate. I'm kind of starting to get my art making energy back, but I definitely plan to slow down from here on out. I've lived my life as though it were a race...the end will get here soon enough, why hasten it? Why not slow down and enjoy the next third of my life?! 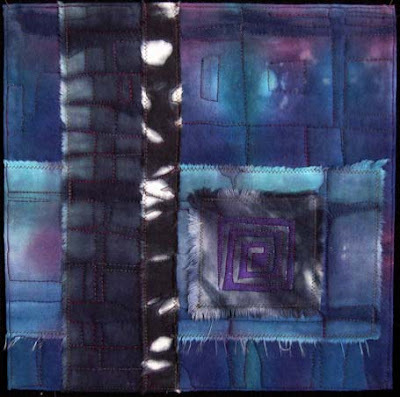 This is weekly quilt 33/52.2009 ~ Strange Magic. Some backstory -- the name Strange Magic came to me when as soon as I dove into my scrap basket earlier this week, ELO's "Strange Magic" started playing in my head. And it hasn't stopped! And that's how some quilts are named. This is also my August quilt. The backstory on that is that the overall color tone of the piece says to me that it's still summer but it has a foot in autumn. And speaking of August, it sure looks like we're finally having a bit of summer here on the North Coast. Today is another beautiful day, right from the get go. Finally, my friend Colette and I will get to take our little adventure today, out to the mouth of the Eel River, as far as we can get anyway. And maybe a walk in the Wildlife Refuge if time and our energy permit. 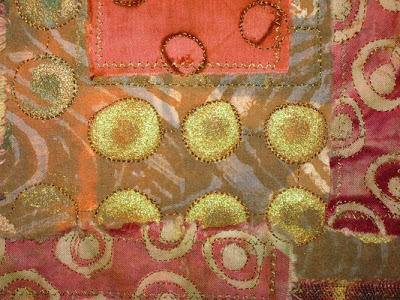 And being in new places means more photos for my Textural Images blog, which is always a good thing! 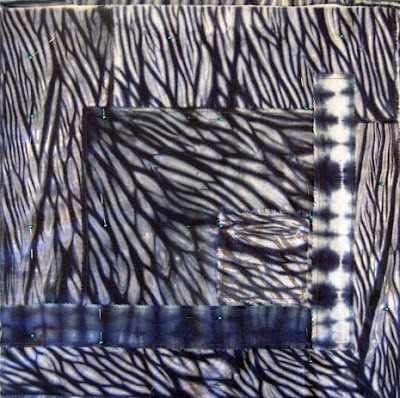 The new quilt, fininshed yesterday, second in the recent shibori series, 17 x 17 inches, titled Torrential Rain. At this moment, I'm NOT waiting for the rain, still enjoying this little slice of summer we're experiencing on the North Coast. But I will be soon, autumn being my very favorite season. 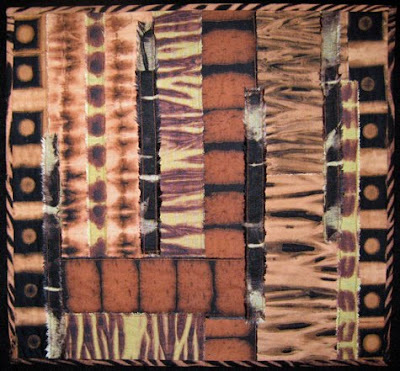 I saw a terrific show last night at our local Piante Gallery (one of very few, maybe the only real gallery in Eureka) of encaustic work by Kathleen Zeppegno. 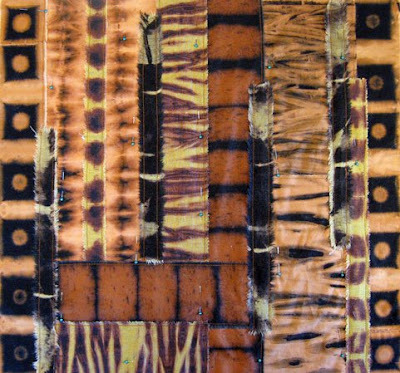 Her work is more highly textured than other encaustics I've seen -- although I admit to only seeing other work in printed format, not in the flesh -- and abstract. Very thought provoking and inspiring for me. Off to the studio shortly! 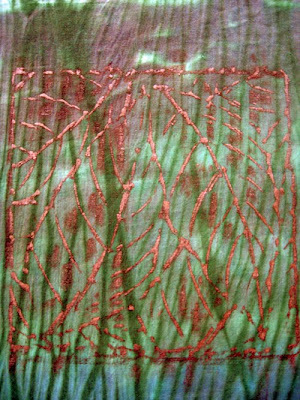 With some printing techniques, it can be difficult to achieve the results you want with thickened dyes ~ nevertheless, I give it a go periodically. Most definitely, deconstructed screen printing is chief among the techinques that work beautifully with thickened dyes, in fact you wouldn't want to use textile paint on the screens unless you washed it out right away so the screen wouldn't become irrevocably damaged. Also, direct printing works really well with thickened dyes, and I do it all the time. These photos are of my last go-round of monoprinting with thickened dyes, and truth be told, I did a bit of direct printing on top of each piece because the original prints weren't what I wanted. 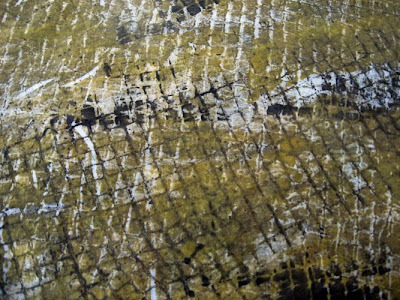 Monoprinting, for those who might not know, is where you put paint or ink on a surface -- tempered glass or acrylic work well -- then texturize the paint or finger paint in it, or do something to create an image, then lay a piece of fabric or paper over the surface and roll over it with a brayer or rolling pin. Then pull up the fabric or paper and there's your print. This doesn't work so well with thickened dye, in my experience. Perhaps it's a matter of getting even more dye powder in the paste than I usually use, but I think it's because the viscosity of thickened dye is just different than it is with paint. 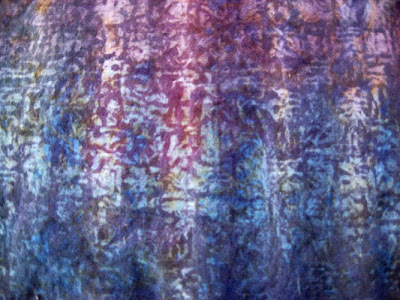 Also, I think it might be inherently different because paint lays on the surface of the fabric whereas dye changes the molecular structure of the fiber, so essentially the dye print is absorbed into the fabric rather than staying on the surface as a paint print will. 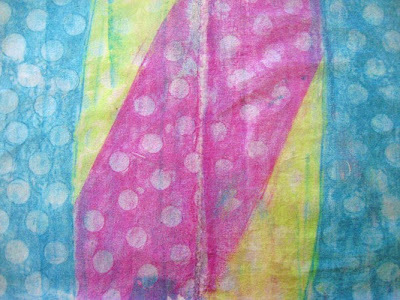 Since I'm not "in the mood" these days to invest in textile paints, I think I'll stick to what I know works with thickened dyes ~ deconstructed and direct printing! 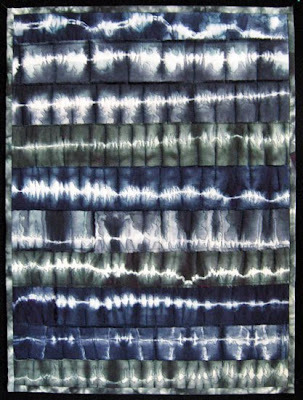 This is my first finished piece from the "black" shibori batches I did recently. Recall that I did three batches with three different Procion black dyes. Each black leaned toward green, blue/turquoise or blue/purple. I do intend to do another batch with two of the blacks together, likely next week. 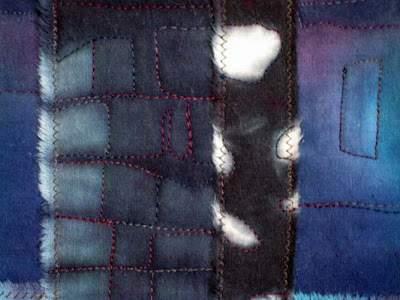 What's interesting is that the blacks that I did get look quite a bit like different shades of indigo. 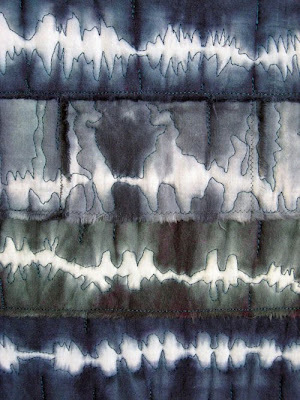 Anyhow, this quilt is called Pulsation. I really enjoyed working on it this week and am happy with the way it turned out. A follow up to yesterday's note about my feeling blue ~ I was in better spirits today than I'd been all week. I'm thinking, whatever energetic effect happening recently has either passed, or I've gotten into the groove with it. On to the next piece ready to quilt...and those stacks of fabric are still on my table waiting to be arranged! This week's quilt, 32/52.2009 ~ Mood Indigo, is telling of where my head's been at recently...kind of blue (as Miles Davis would say). Not sure what's going on, but I've been a bit down. Still getting lots done, but without my usual emotional jazz to back it up. Maybe it's these dreary overcast summer days. I'm finally getting this uploaded, after having my hard drive crash and getting it replaced. And getting back online. In addition to the piece I posted a photo of last Friday, and which is now pieced, backed, basted and ready to quilt, I've got these three other quilts ready for the machine. Two are still pinned in these photos taken early this morning, but now all are good to go. The first one here is the latest in my discharge series, number eight. 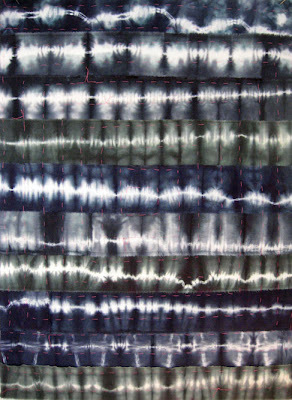 And the second and third are from my black shibori batches. I've also got this week's quilt ready to go, and plan to stitch that one first, of course. But I'm on a roll ripping fabrics up and designing quilts, so I may do another couple before I begin quilting in earnest. In fact, I've got three or four piles of fabrics on my table just waiting to see what I come up with. So we'll see what tomorrow brings.